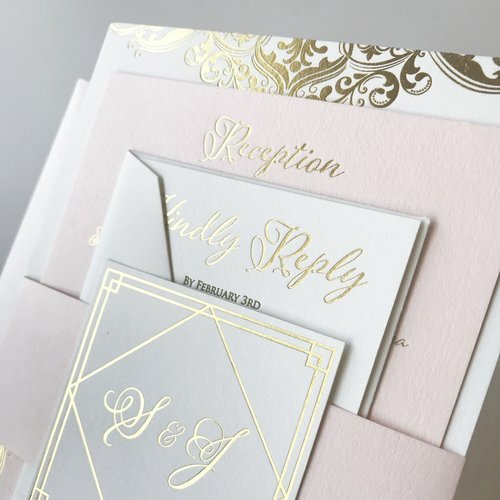 Your wedding stationery isn’t just an informative key piece- it’s your guests’ first peak at your wedding day. We believe this piece is an opportunity to convey your love story and personalities; both makes for memorable stationery and it drives our love for what we do! It can become overwhelming to see all of the different style’s out there. We understand. If you’re having difficulties with deciding, feel free to shoot us an email and we can work something out. Or, if you’re searching for inspiration, please check out our Pinterest page for our past projects. Ryan created the most beautiful invitations for my wedding! He was very timely and detailed with responses, which I think is so important, and an absolute joy to work with. My “wedding committee” and I were very particular about little details and colors and he took extra time to send me pictures and samples to make sure we had the best turn out! Throughout the stages of making the invitations, he also sent me videos and pictures of the process which was so cool. Shipping them was a very smooth process, as well! I can’t thank you guys enough and I’m so beyond happy with the turn out!! I had so many compliments from our guests! Highly recommend!! They’re the best!! I used M.C. Pressure for our Save the Dates. I already had a design worked up that Ryan ran with and sent back proofs for. He was accommodating and quick with the couple changes I needed. Once I confirmed, the printing was fast and delivery took two days. He was super kind and wanted to make sure I was happy with everything. The customer service and affordable price compared to some other shops was wonderful. I'll be looking forward to the next thing I need and to see how their own custom designs turn out! Thanks again! Ryan exceeded all of my expectations when designing my wedding invitations. Not only was the finished product ABSOLUTELY GORGEOUS-he kept me updated along the production process even sending me sneak peaks of finished pieces and videos of my invitations being foiled or letter pressed. Aside from the beautiful invitations, Ryan was a pleasure to work with, extremely helpful, creative and so nice. I never thought I would be able to afford the products that Ryan created for me in a reasonable price... the letterpress, gold foil & paper designs were unimaginably perfect! I cant recommend this company enough!